The Minnesota Department of Transportation (MnDOT) will be constructing Diverging Diamond Interchanges (DDI) throughout the state in hopes of cutting overall traffic delays up to 60 percent, improving safety by eliminating standard intersection geometrics and conflict points, and providing better traffic operations and show some excess capacity 20 years into the future. The Elk Run Interchange Project's was one of the first DDIs in Minnesota. 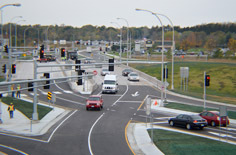 The newly-constructed diverging diamond interchange at Highway 15 and County Road 120 in Sartell and St. Cloud opened to traffic on Oct. 17. And a DDI at 494 and 34th Avenue also opened recently. To learn more about DDIs, their design and goals, and links to related articles and news, visit the MnDOT website. View the City of Bloomington video on how to navigate DDIs.